Before you read this review, please understand that there will be spoilers if you have not read Divergent or Insurgent, the first two books in this trilogy. I know I should have reviewed them first, but it would turn out really terrible since I read both a year ago and have no recollection of what I was thinking or feeling. To simply put it, READ DIVERGENT. The movie is coming out early 2014 anyway so do yourself a favor and just read it! The faction-based society that Tris Prior once believed in is shattered — fractured by violence and power struggles and scarred by loss and betrayal. So when offered a chance to explore the world past the limits she’s known, Tris is ready. Perhaps beyond the fence, she and Tobias will find a simple new life together, free from complicated lies, tangled loyalties, and painful memories. But Tris’s new reality is even more alarming than the one she left behind. Old discoveries are quickly rendered meaningless. Explosive new truths change the hearts of those she loves. And once again, Tris must battle to comprehend the complexities of human nature — and of herself — while facing impossible choices about courage, allegiance, sacrifice, and love. I didn't have a hard time getting through this book, especially because I was eager to read about how it all ends. Roth wrote Allegiant with two different narrators; one being Tris, the main narrator in the first two books, and the other being Tobias. Although I did not particularly enjoy the switching of perspectives for each chapter, I thought it was necessary for the storyline to progress and, eventually, bring closure. Surprisingly, I ended up liking Tobias' point-of-view a lot. One of the parts I really enjoyed was when we were given a look outside the city. (In the first two books, we are not given any details on what goes on outside their main living area.) Tris and her group of friends finally travel outside of their city, where most of Allegiant takes place. Sadly, they rarely leave the inside of a building (my attempt at being discreet) so we don't get to be around the outside people much. However, the character development of those we already know was noteworthy and remarkable — my opinions of certain characters, one in particular, changed dramatically as the story continued. I was able to sympathize for him (hint hint) near the end of the book and couldn't believe my change of heart. I think it's crucial for a book to have characters who make you feel strong emotions, and Veronica Roth did that very well. Contrary to what a lot of people have been saying about the ending, I thought it was done well and I respect how Veronica Roth ended the trilogy. Although I am not happy with what happened, I think it was the right thing to do. 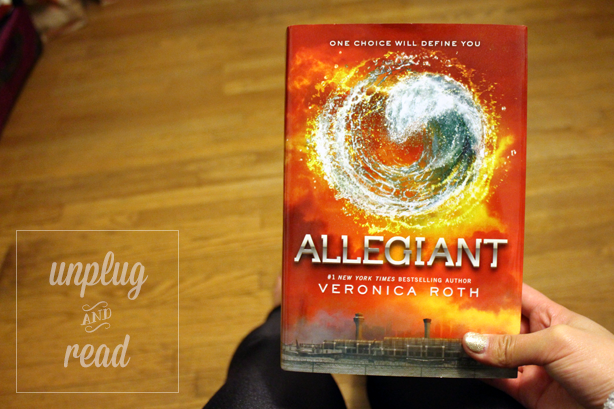 Overall, I did enjoy Allegiant and thought it was a good last book. Let me know if you want to read a discussion post about what I thought throughout the entire book. I wanted to keep the spoilers to a minimum, but I would love to talk about what happened! Hi there! :D I agree with you about the ending. I loved how Roth developed the characters and made you feel close to them. Ugh I'm so sad that it's over though lol. I would love to read a discussion post about what you thought throughout the book! I want to talk about what happened too! Yea, I hope the movie justifies the book. I always get worried about how the movie will be compared to the book. I kind of want to read the trilogy again for fun and cry all over again lol. I'm not reading anything at the moment. Before I finished Allegiant I read Ender's Game before the movie came out. Did you read that? Are you reading anything right now? I feel like nothing will top Allegiant at the moment haha.